Three undergraduates in UCLA’s College of Letters and Science are among 72 outstanding college students selected nationally by the Council on Undergraduate Research to present their original research on Capitol Hill in Washington, D.C.
Diana Libuda, majoring in molecular, cell and developmental biology, with a minor in music history. Libuda conducts research on the role of a molecule in spinal cord development. She is from Poway, a suburb of San Diego in the inland north county, and lives in Westwood. Kayvan Zainabadi, majoring in molecular, cell and developmental biology, studies the genetics of cervical cancer. He is from the San Fernando Valley, and currently lives in Westwood. Heather Coleman, double majoring in marine biology and atmospheric sciences. Coleman has done environmental research on coral reefs — something of a misnomer in recent years as the coral has dramatically decreased and algae has increased — and on rare plant species in the Santa Monica Mountains. She is from Pacific Palisades, and lives in Venice. When Diana Libuda would read in her science classes about discoveries, she used to wonder what went on behind the scenes in laboratories that led to the remarkable results that made their way into textbooks. Starting her sophomore year, she worked in laboratories, doing gene therapy and DNA replication — and she absolutely loved it. She also came to see how much work is involved. “Things you spend months working on may end up being one sentence in a journal article,” she said. “I realized what I want to do with my life,” said Libuda, who has won numerous accolades for her outstanding scholarship, including a National Science Foundation graduate fellowship and a Barry Goldwater scholarship. She plans to earn her Ph.D. in biomedical science, to have her own research lab, and to be a scientist and professor. Karen Lyons, UCLA associate professor of molecular, cell and developmental biology, in whose lab Libuda works, is very confident Libuda will succeed. Libuda is investigating the role of a molecule called BMP-11 in spinal cord development, and characterizing its function by analyzing molecular markers for distinct cell types in the developing spinal cord. Her preliminary results indicate the molecule plays a role in motor neuron differentiation. She is co-author of a research article that has been accepted for publication by the peer-reviewed journal, Development. “A better understanding of how growth factors such as BMP-11 orchestrate the development of the spinal cord is a necessary step in developing effective therapies for the treatment of spinal cord injuries and congenital defects,” Libuda said. After her graduation in June, Libuda will attend Harvard, where she will earn her Ph.D. in biological and biomedical sciences. Libuda, who also considered attending Stanford and UC Berkeley, speaks highly of her years at UCLA. Her research was an important part of her undergraduate education. When Kayvan Zainabadi started college, he told people he planned to go to medical school and become a doctor. He has conducted research for three-and-a-half years in the laboratory of Eri Srivatsan, UCLA adjunct associate professor of surgery, and it didn’t take long for Zainabadi to find the passion that he lacked for medical school. Cervical cancer, one of the leading causes of death among women, affects an estimated 500,000 women worldwide and 13,000 in the United States annually. In his laboratory, Srivatsan has been working to identify the precise location of the gene responsible for cervical cancer. He has now identified a candidate gene — a tumor-suppressor gene called PACS-1, which acts as a protein transporter. In addition, he has found that other types of tumors, including liver, kidney and lymphomas, also show aberrant expression of the PACS-1 gene. This implies that the gene also may be involved in other types of cancer, as well as cervical cancer. Srivatsan has genetically mapped the area extensively and isolated genetic markers that could be used for genetic testing. “The research will help with early detection of cervical cancer,” Zainabadi said. Pap-smear tests, a great advance in cervical cancer detection, work by obtaining cells from the cervix and searching for cancerous-looking cells. DNA testing, in contrast, will be able to precisely identify people harboring mutations in important genes before cancer develops. Genetic screening could identify people who are at risk for developing the disease, which would allow for earlier treatment and lower mortality rates. Working in the lab, Zainabadi has studied normal and tumor DNA from patients who develop cervical cancer, attempting to identify the genetic changes that occur in creating a tumor cell. He has also isolated genetic markers and helped in narrowing the region, which at the time he began in Srivatsan’s laboratory encompassed a significantly larger area. Zainabadi has high praise for his faculty mentor. As a Howard Hughes Research Fellow, Zainabadi receives research support from the Howard Hughes Undergraduate Research Program, and attends a weekly journal seminar to discuss scientific research and to present research findings. His other honors include a Fredrick Waingrow Research Scholarship. After his graduation this June, Zainabadi plans to attend MIT to earn his Ph.D. in biology. He plans to specialize in genetics and cancer biology. Heather Coleman has spent three years conducting conservation-related research. After she graduates in June, she plans to spend a year doing oceanographic research in the UCLA laboratory of Nicolas Gruber, before earning her Ph.D. in marine ecology. She plans to become a conservation ecologist or marine biologist, and to influence public policy, perhaps working on habitat destruction, or sewage spills into oceans, for a nonprofit organization. Coleman described Levine as “very helpful,” and said she learned about experimental design and statistics from him. She conducted research last year in Jamaica, where sewage, over-fishing and hurricanes have severely damaged coral reefs. Coleman studied the effects of a tropical sea urchin on snails sharing the shallow back-reef habitat, in what Levine described as a “well-replicated field experiment to examine the effects of the urchin on snail growth.” She conducted additional experiments and sampling to quantify the impacts of this interaction on nearby seagrass beds, which she said are “critical habitats and nurseries” for species such as fish and lobster, as well as the base of numerous food chains. This year, she has been examining the impacts of invasive plants in the Santa Monica Mountains, and studying the environments in which native plant species grow best. She has also done research on coral reefs in Akumal, Mexico, south of Cancun, where she said sewage is destroying coral reefs. She has volunteered at the Ocean Discovery Center in Santa Monica, taking care of fish and teaching about conservation and marine biology. Coleman speaks highly of her research experiences and her undergraduate education at UCLA. The Council on Undergraduate Research is an independent national association that supports undergraduate student-faculty collaborative research. The council represents faculty and administrators at nearly 1,000 academic institutions. 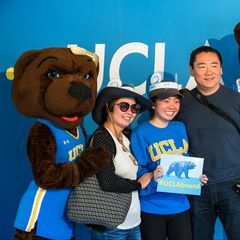 “Our goal is to make UCLA the leading research university in the nation for undergraduate research,” said Judith L. Smith, vice provost for undergraduate education in the College of Letters and Science. All three of these students have received full-fee scholarships and are part of the College’s Undergraduate Research Scholars Program. Audrey Cramer, director of UCLA’s Life and Physical Sciences Undergraduate Research Center, said, “When students engage in research, they see the connections between what they are learning in class and what they are discovering in a laboratory — and those insights help them to see learning in anew light.” Cramer said. Funding new undergraduate research scholarships is the highest priority for Vice Provost Smith. For information about how you can support a UCLA student scholarship, please call Beatrix Richman in the College of Letters and Science development office at (310) 825-8654 or e-mail her at brichman@support.ucla.edu.